Right after Trump won, a cousin offered to send me some anti-Hillary literature that she thought I’d find convincing. I responded that if Hillary had won, she and I would be safe. But Trump’s victory emboldened those who would be perfectly happy exercising what Trump euphemistically called their Second Amendment rights, getting rid of people who don’t fit their racial and religious criteria. They were already on the streets. That left neither of us safe. Nor is the problem just what some of his supporters believe and do. His campaign and rhetoric were about who should not be here. He continually appeals to his most extreme supporters, people who barely conceal their admiration for Hitler. Many of us have been talking about how polarized our politics have become. Polarized politics is dangerous because it is a predicate for autocracy. If people become convinced that they can’t live with the other side’s victory, that life is too dangerous, democracy becomes unsustainable. When a live and let live attitude is gone, democracy can’t be trusted. Trump can’t be trusted. Trump stands for exactly the kind of politics that makes democracy feel more dangerous than valuable. During the campaign, he told his supporters to express their “second Amendment rights” at the polls, sending chills down the spines of loyal Americans. When neo-Fascists showed up to demonstrate in Charlottesville fully armed to sow fear and intimidation, and one of their sympathizers murdered a peaceful and unarmed woman in the crowd, Trump blamed their opponents for the carnage. To Trump and his white supremacist supporters, evil is racial – Hispanic, immigrant, Puerto Rican, or Muslim, Blacks, Jews, minorities and women. When he tried to export his racist friends to the Brits, they told him to stay out of Britain. Bless the Brits. They get what this country used to stand for – we are [quote] “one nation … indivisible, with liberty and justice for all.” Liberty and democracy are “indivisible”; they are and must be for ALL. A descent into racism, Nazi or otherwise, would not make America great again. It would destroy our country. One of the things I found fascinating in the papers of the UN Commission on Human Rights which produced the UN Declaration of Human Rights, was that human rights was not an American idea foisted on the world. Hatred of the Nazis came from across the globe, all continents, all its peoples. What they saw, regardless of economic or political system or religious or ethnic heritage was that the Nazis were a threat to everyone. All countries worked with the single-minded goal that there should be no more Hitlers, no more Nazi control of any country. The world had defeated the Nazis and they weren’t about to have to do it again. Trump doesn’t get or care that democracy depends on our agreement that all Americans are legitimate Americans, all Americans need to be respected and cared about, and all Americans need to feel safe here, or he is wielding the demonization of some of us precisely to end self-government. When I was a kid, there was a radio program that some of you will remember. It’s tag line, voiced by actor Frank Readick Jr., was “what evil lurks in the hearts of men, the Shadow knows.” I make no claim to knowing what evil does or doesn’t lurk in the heart of Trump. But threatening America from the inside, he is the biggest threat to the survival of America since our Civil War. — This commentary was broadcast on WAMC Northeast Report, January 16, 2018. Can American Democracy Survive Trump? Will democracy in America survive? First remember that democracy matters. No human institutions are perfect but democracy makes it possible to remove officials without going to war. Democracy doesn’t mean anyone alone can make good things happen. Democracy reflects the collective power of people. Collectively, if the rules are followed that protect speakers, publishers, candidates and fair elections, democracy gives us the possibility – though nothing is certain – of throwing the bastards out. That’s important. The survival of democracy depends on leaders, institutions, and the circumstances that bring out the best and worst in us. What chance do we have? We should have been warned when Trump repeatedly expressed admiration for dictators in Russia, the Near East and Eastern Europe, when Trump invited an enemy to break into a candidate’s email and interfere in an American election, and suggested his supporters use their “Second Amendment rights” to put him into power. We should have been warned when Trump put people with strong ties to hostile powers at the top of his Administration and gave them access to American military and intelligence secrets. We should have been warned when Trump put an attorney hostile to justice in charge of the Justice Department and installed many military leaders in his government. We can’t rely on this casino mogul turned would-be strongman to preserve American democratic government. It’s unclear whether our institutions will protect us. The Turkish military protected Turkish democracy for a century, but that tradition is now gone. Members of Trump’s party control both houses of Congress where their commitment to their party compromises their commitment to democracy. Congress seems unlikely to protect us. The Court is dominated by members of the President’s party and their treatment of the Constitution’s due process clauses has been more a threat to decent citizens than a limitation on the powers of would-be dictators. The circumstances in which we find ourselves have ripped democracies apart across the globe. The concentration of wealth and power we have long seen and condemned abroad has become a reality here. The more that wealth and power are concentrated, the more that the wealthy and powerful circle their wagons to protect their ill-gotten gains against the rest of us, spewing nonsense about supposed trickle-down economics as if it were fact and counting on people’s gullibility. Concentration also makes people desperate, and desperation fuels the mirage of lies and makes too many of us complicit in our own subjugation. Without reason to rely on the leaders, institutions, or circumstances, that leaves us. Can we square our shoulders and steady our minds to resist the steady babble of nonsense and not just listen to the words but watch what those in power are doing? When you look at behavior instead of giving a pass to the mogul in the White House, you begin to notice that his actions belie his words. He has no sympathy for coal miners or others who have been shunted aside by changes in the economy but only to protect his friends’ wealth and power from us. Birnie put his finger on the problem and Trump now aggravates the concentration of wealth and power that are taking apart the lives we thought we’d built. So-called “free markets” protect the marketeers. So-called “trickle down economics” protect the concentrations from which the trickles are supposed to flow. And the flood of inconsistent tweets boggle the mind and conceal the reality. Can we uncover the deceptions with strong minds and clear eyes while the casino mogul in the White House gambles our birthright. — This commentary was broadcast on WAMC Northeast Report, June 13, 2017. Should We Just “Get Over it”? Trump’s supporters claim liberals should “get over it.” Trump was elected so we should “get over it.” Really? What should we “get over”? We should certainly “get over” losing a popularity contest – a high school election or selection of a beauty queen. But getting over real damage is shallow and heartless. It may be our privilege to “get over” our own losses, but we don’t have the moral privilege of “getting over” impending death, damage and destruction to others that we could have stopped? Trump’s opposition to environmental rules will poison the air and water. Should we get over it before or after people sicken and die? Before or after children are poisoned, injured or permanently damaged? Trump’s abandonment of green power and his promotion of fossil fuels and fracking will boil our world, flood our coasts, smash our homes with violent storms, unleash new infections on us, and parch our lands and lips with drought. Should we get over it or try to prevent it? Should we celebrate while we’re spared or should we cry for family, friends, and neighbors? Vive la France! But Trump’s attack on European unity emboldens the world’s dictators and masks his own desire to join them. Should we celebrate unraveling the European union that put a stop to the most deadly wars in the earth’s history and nearly destroyed our closest allies? Or should we try to keep it strong? Trump’s attacks on regulation threaten to crush the vulnerable. Should we celebrate their misfortune? Trump removed brokers’ obligations to protect their clients’ interests. Shall we thank him for encouraging fraud? For trumping decency. Perhaps we can get over our own losses, but should we “get over” the consequences to other hard-working and decent people all over the country? Should we get over the decency in our own hearts? Is it weakness to care about others? Or are we strong enough to care? Trump keeps talking about making the country great again, while selling it out and most of it’s people for the selfishness of a few. Should we reward him for it? What should we respect in ourselves and each other? That our so-called “Second Amendment rights” threaten others’ lives whenever anyone loses their tempers, becomes frustrated or jumps to conclusions? Are we on the way to becoming a nation of barroom brawlers congratulating whoever is strong or fast enough to kill everyone else? Is that the great new America? Trump has called off investigations into police killings. Should we respect people we call “lawmen” who are so scared of a man putting his key in his door that they have to shoot him instantly? Do America’s “bravest” shoot men in the back, on the ground or with their hands up? Or is cowardice the new bravery? Is Trump encouraging chaos so that he can step in with dictatorial powers claiming that it’s necessary for our own safety to shoot men in the back? There is nothing in the White House to get over. There is everything to stop, control, limit, prevent. The imposter-president is a threat to meet, not a bet to get over. — This commentary was broadcast on WAMC Northeast Report, May 9, 2017. Is Democracy in America Coming Apart? 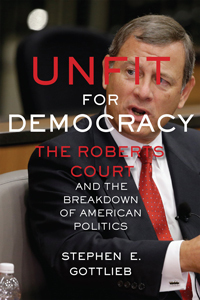 I wrote Unfit for Democracy to warn that American democracy could collapse in coming decades. But the problems are coming home to roost sooner than I expected. How the economy treats people matters. That was the starting point for my work and, since World War II, for political scientists studying the survival or breakdown of democracy. But the American economy has been leaving lots of people behind. In my book I argued that the Supreme Court was diluting the value of ordinary Americans’ economic rights in favor of the wealthiest people and corporations. I feared the danger to democracy as people became more and more desperate. I also worried the Court wasn’t enforcing the Bill of Rights for ordinary people and feared would-be dictators could take advantage of it. And I worried because the Court permitted politicians to fix the voting mechanisms to make fair elections almost impossible. Changes made after the 2010 census allowed Republican-dominated legislatures to lock Democrats out of Congress and the majority of state legislatures for the foreseeable future. That Court-sanctioned gerrymandering now blocks fair representation in Congress and in many states. Trump kept claiming that the system was fixed, implying that it was fixed against him, but the Court allowed the Republican Party to block access to the polls in many states. The election was partly fixed, in favor of the Republicans and Mr. Trump. I also worried that legal changes underlying changes in the media and the primary systems were contributing to the polarization of America. As Jim Hightower once titled a book, There’s Nothing in the Middle of the Road but Yellow Stripes and Dead Armadillos. I thought that was dangerous. Now we are finding out that only a quarter of Americans still believe that it is important to live in a democracy. And we’ve elected a president who befriends autocrats – autocrats who destroyed democratic governments, censored the press, put opponents in prison, and took over. Once that happens, the people who wanted to break the system down have no voice in what the new system does. Autocrats around the globe become kleptocrats – they steal from everyone for themselves and their friends. In commentary earlier this year I described that as the Sheriff of Nottingham syndrome – the sheriff from the Robin Hood legend who took from the poor to fill the pockets of King John. Corruption in democracies doesn’t hold a candle to what autocrats do to their people financially, how opportunities suddenly depend on the dictators’ favor, how freedom disappears, real freedom, the freedom to walk around out of prison and take care of one’s family. Those folks who were so ready to break the system are likely to be among the first broken by it. He seems to think that winning means he can do whatever he wants. And he and the Republicans seem to believe recounts are legitimate only for themselves – not to protect and enforce the voters’ choices. If American democracy collapses, it will be the biggest victory for the world’s worst people. As Trump pounds on the pillars of democracy, we will have to do all we can to preserve the American democratic way of life. Unfit for Democracy, at 195-204. Id. at 153-67; Law and the Polarization of American Politics, 25 GEORGIA STATE L. REV. 339 (2008). — This commentary was broadcast on WAMC Northeast Report, December 5, 2016. Over a century ago, populism was sweeping the country, with white and African-American workers standing together, until a scared Southern aristocracy started race-baiting. Whites took the bait, breaking the back of Southern populism. The rest of the country surged forward because their governments cared about the people, the regular people, not just the fancy financiers. But not in the South, which languished. That race-baiting aristocracy also killed political competition, leading to the one-party South. No democracy, no concern for the people, no progress. Because race-baiting broke the back of Populism. Trump uses rhetoric to divide the people hoping he and his cronies can conquer while the rest of us fight each other. Trump attacks everyone – immigrants, African-, Hispanic-, and Muslim-Americans, women, hard-working, warm-hearted, caring Americans of every background. Democracy is in danger when people can’t accept the legitimacy of disagreement, drown out and threaten opponents, and don’t respect the right to vote of other people because of where they live or where their parents came from. Losing respect for others threatens democracy. Most of us believe that everyone has a right to their opinion. Democracy is in trouble when some try to shut down that right. Democracy is threatened by campaign crowds yelling “Lock her up” and “Hang her in the streets.” Promising to appoint a special prosecutor to go after Hillary, Donald feeds their hostility to democracy. Like Italy’s Berlusconi, Donald tries to cover revelations about his behavior by throwing hate to angry crowds. Hillary responds “That happens in dictatorships, not democracies.” She’s nailed it; Trump does not want to lead a democratic country; he’s trying to sabotage it. Trump’s racism and nativism has broken the back of the movement for economic justice. His invitation to settling the election by beating people up and using their Second Amendment rights encourages force, intimidation and even guns, to take Hillary out. Telling his supporters to prevent the polls being rigged codes Trump’s message to control the election by threats and intimidation. Democracy is in serious trouble when police and military institutions take sides. Individuals in the uniformed services have every right to their political views. But we’ve had a tradition of keeping the military out of politics. We should be able to rely on them to protect every voter’s rights regardless of politics. The military and police need to be above politics or democracy is at risk. Trump is trying to forge a coalition to muscle democracy out of the way. If the self-proclaimed rich guy wins, he knows how to enrich himself and his cronies. But he pulls his supporters along with constantly repeated half-truths, lies and fabrications until they seem true because he says them so often – stringing them together like a rant overwhelming any attempt to answer because there’s too much to deal with. Economic desperation leaves many open to his lies. But they cannot put a populist program together on the back of a divided America. They cannot get government to work on behalf of all the people, not just the super rich, by dividing over skin color, national origin and gender. The Constitution, the Declaration, the Founders’ legacy, are in trouble when despondent and demoralized people lose faith in self-government. When democracy is in trouble, everyone is in trouble because dictators don’t take care of their people – they take care of themselves. These same patterns have brought democracy down in many parts of the globe. But for Mr. Trump, we’re all losers and our democracy is a loser too. For Trump, only Trump counts. — This commentary was broadcast on WAMC Northeast Report, October 25, 2016.